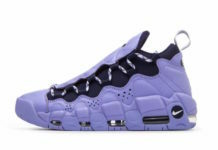 The newest rendition of the Nike Air More Money is the LX version, which has just debuted in a brand new iteration strictly for the ladies. Dressed in a Black, Summit White, and Metallic Pewter color scheme. This Nike Air More Money features a Black neoprene upper highlighted with a crinkled leather overlay. The shoe also comes with two reversible lace shroud in either Black suede or leather atop a White midsole and Black rubber outsole. Check out the official photos below, and you can now find this Nike Air More Money LX available in women’s sizing directly on Nike.com. The retail price tag is set at $160 USD.